Colorectal cancer (CRC) is one of the most common malignancies in the world. 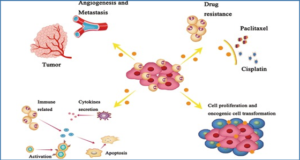 Easier recurrence and metastasis is the main cause of mortality in CRC patients, and the markers applied for diagnosis and treatment of CRC is still urgently needed to early diagnose and evaluate therapeutic effect. Long noncoding RNA (lncRNA) is a class of noncoding RNA that the length is more than 200 nucleotides. With the development of sequencing technique about transcriptome, increasing lncRNAs are focused on their function and mechanism related to the nosogenesis and pathology of CRC. Recent studies report that lncRNAs acted as crucial role in CRC and could be as biomarker for CRC diagnosis and treatment. 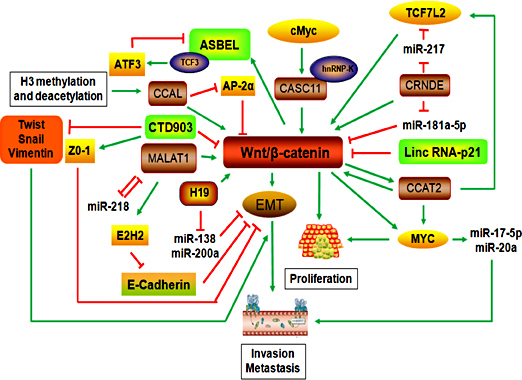 Researchers from Zhengzhou University discuss the regulation of lncRNA by interacting with DNA, RNA and protein and highlight the double role of lncRNAs as oncogene or anti-tumor gene involved in Wnt signaling pathway, p53 signaling pathway or others to be an regulator in CRC development. Lastly, they discuss some new finding of lncRNAs, especially lncRNA in exosome, which could be as potential markers for diagnosis and treatment of CRC in future. Red arrows represented inhibition of p53 pathways; Green arrows indicated promotion of p53 pathways. Red rectangles indicated onco-lncRNAs. Violetrectangles represented suppessor of lncRNAs. Red rectangles indicated oncogene of lncRNAs. Purplerectangles indicated tumor suppressor of lncRNAs.